ELEANOR ROOSEVELT, First Lady of the United States and first ambassador to the United Nations died on this date (b. 1884). The wife of President Franklin Delano Roosevelt, Eleanor is considered one of the most iconic first ladies. In 1933, Roosevelt had a very close relationship with Lorena Hickok, a reporter who had covered her during the campaign and early days of the Roosevelt administration and sensed her discontent, which spanned her early years in the White House. On the day of her husband’s inauguration, she was wearing a sapphire ring that Hickok had given her. When their correspondence was made public in 1978, it became clear that Roosevelt would write such endearments as, “I want to put my arms around you & kiss you at the corner of your mouth.” It is unknown if her husband was aware of the relationship, which scholar Lillian Faderman has deemed to be Lesbian. 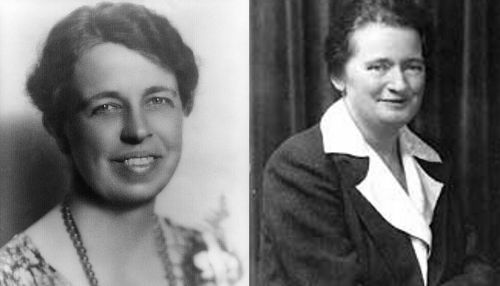 In both her first and second volumes Eleanor Roosevelt’s biographer, Blanche Wiesen Cook, assumes a Lesbian relationship between Roosevelt and Hickok. Susan Quinn’s 2016 dual bio Eleanor and Hick: The Love Affair That Shaped a First Lady doesn’t mince words and looks closely at this important relationship with a clear-eyed appraisal of their love affair.